Based on the recipe from the Hummingbird Bakery book. I decided to make a multi-coloured velvet cake to represent my school's house system by doing a layer of green, red, and blue, sandwiched and covered in yellow cream cheese icing. That was the idea. I had grand visions of a tall cake covered in smooth yellow, with the awaiting surprise of the multi-colours within when sliced. This cake hardly measured up. I knew it wouldn't work out as soon as I failed to find sandwich tins (20 cm or otherwise) in my local shops (in Stockholm). 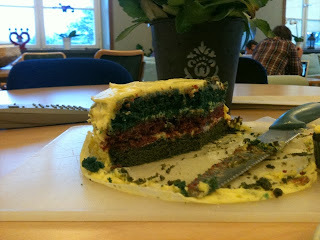 After asking a few Swedes, it seems that the concept of layer cake is a bit foreign to them, at least baking the layers separately. Instead on the rare occasion that they would make a layered cake, they would make a regular/large cake, and cut it into the layers they wanted, and then reassemble. This would never do for me. 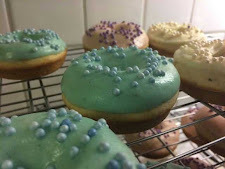 I compromised by buying disposable foil tins (23 cm diameter), and resolving to make batches as advised to produce 12 cupcakes, dye them accordingly, and then make cupcakes from the rest. Disaster. First of all, I only added half as much red dye as needed, and only clocked that I had done so when they came out. A considerable amount of the red cake stuck to the bottom of the tin (yes, I did grease and flour it!). 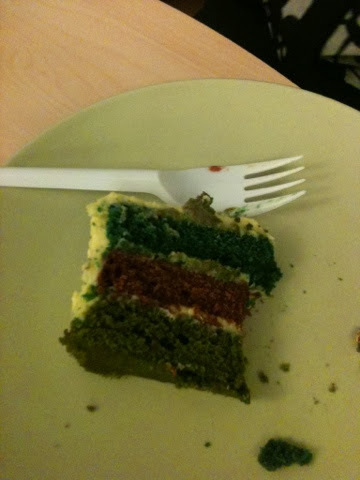 Then the green batter developed an unpleasant brown layer on its top and sides (as did the cupcakes). The blue was alright, but looked far more teal than the navy I was after. Then the Lack of Cooling Racks Tragedy struck. Only having one, which was actually the removable grill part of the pan covered with baking paper, meant that the cakes didn't get the opportunity to cool properly as they were coming out of the oven - my oven is not a fan one, so I baked one cake at a time, followed by the 'residual cupcakes', and so on. At this point, I was too far gone to even consider starting again, so tried to make the best of a bad job by cutting the discolouration off the cooled yet sweaty cakes. It wasn't so bad at this point. Let's make the cream cheese frosting. Oh no! The ridiculously expensive weighing scales I bought merely because of the proximity of the shop and my need for them decided to give me a static electric shock, and refuse to work. I decided to freestyle with the measurements, and came out with some fairly decent icing, despite the yellow not making as much of a difference as I wanted it to. Icing the cake. Literally, this was the icing on the cake. Trying to ice this cake with its exposed and crumby sides was a nightmare; the multi-coloured specks kept 'tainting' the icing, so I was unable to get the clean finish I was after. The end result was a small, squat, sugary mess, that looked like I'd dropped it on the floor. I couldn't even bear to take a picture, I was so ashamed. The cupcakes (and cake) tasted good, however looked extremely unappetising. To improve (should I ever recover enough to return to the scene of the crime), I reckon I should make this as a pound cake, perhaps with a marbled or tiger effect. Although I have a feeling it will still not be what I want. To ice the cake, I will probably use royal icing (the stiffer one used for wedding cakes, I think) despite my aversion to icing - using and eating!